Again, something from a regular work day last week. And again, lots of blue. The jacket is pretty sturdy cotton and from Boglioli, shirt and cardigan from SuitSupply, tie a 7-fold silk tie from E. Marinella, belt from Equus Leather, chinos from Incotex and chukka boots from Loake. Even though I would see this outfit as quite colorful, it's pretty fail-safe. 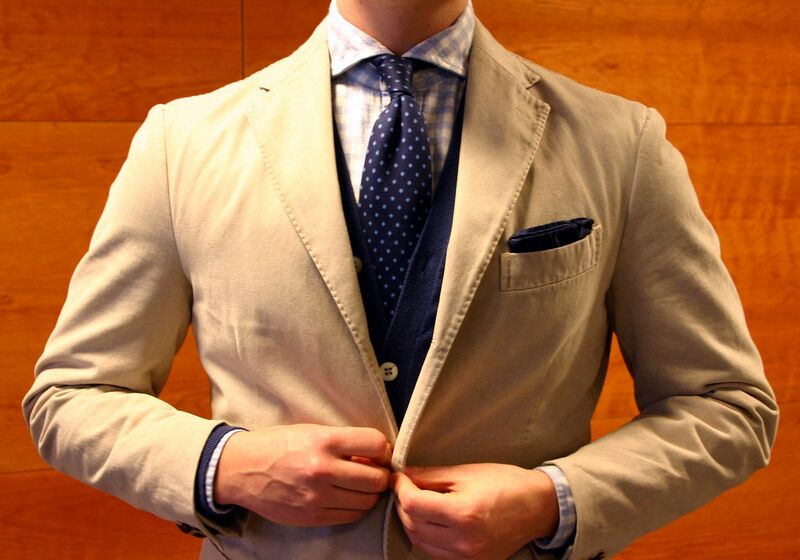 A light beige cotton jacket with fresh navy and dark shades of blue is a classic that will always look great no matter where you are in the world. The cardigan is perhaps the playful component here, but keeping everything in harmony it actually doesn't really jump out in any way. Just adds a touch of color and keeps you warm (so much so actually that I remember having to take the hefty jacket off in the office). To add the last touch a patterned shirt is a good option, and I've gone for a white light blue gingham check spread collar shirt in this occasion. 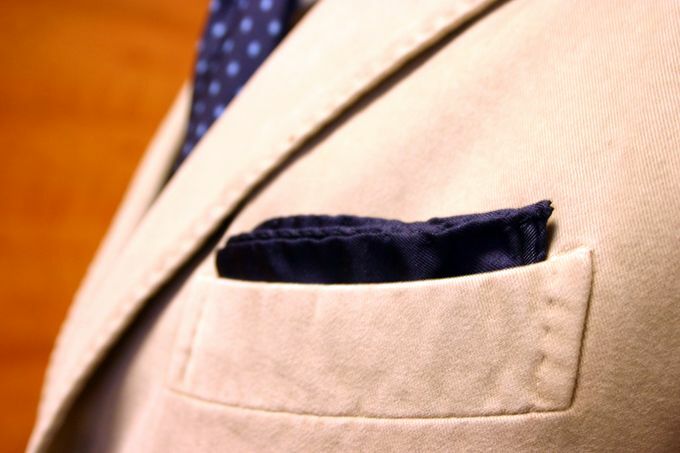 A navy silk pocket square simply folded. A too outrageous buff would be a bit too much here in my opinion. 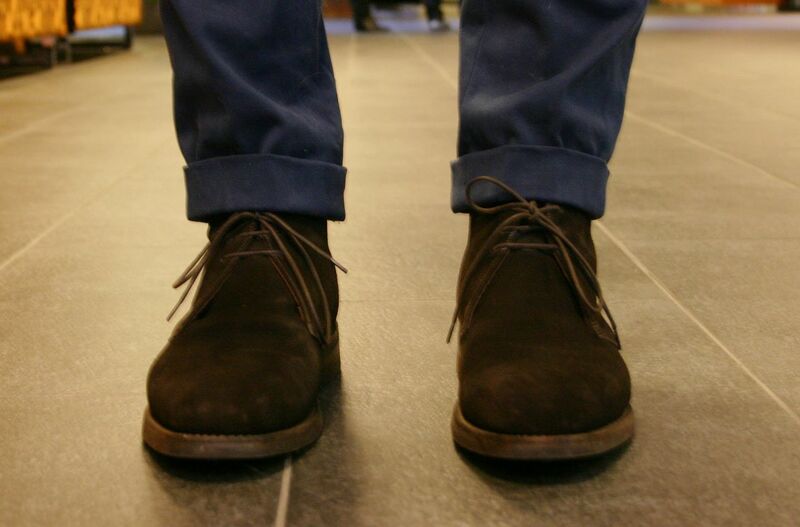 And then, a simple pair of chukka boots, in espresso suede. 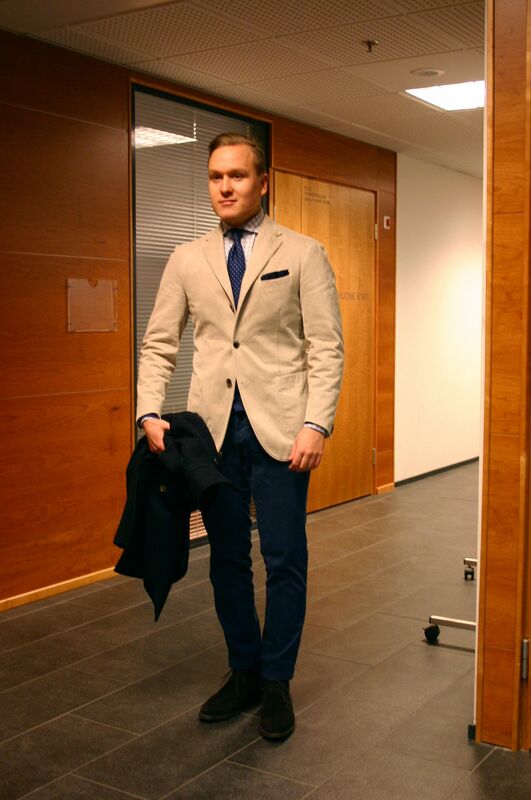 A type of shoe that works in so many settings, this kind of semi-formal office wear being one of the best examples. This is also a good picture to show what I consider as an ideal leg opening width when compared to your shoes. Not too slim, but not wide.